PACIFIC RIM UPRISING. (DVD Artwork). ©Universal. A decade after the events of the first film, the Kaiju return in “Pacific Rim Uprising” with a new deadly threat that reignites the conflict between these otherworldly monsters of mass destruction and Jaegers, the human-piloted super-machines that were built to vanquish them. 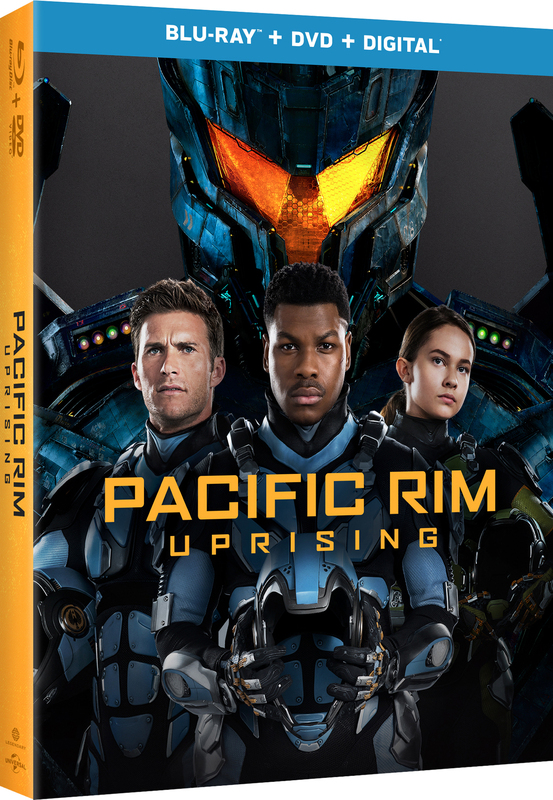 Pacific Rim Uprising arrives 4K Ultra HD, 3D Blu-ray, Blu-ray, DVD and On Demand Tuesday June 19, from Universal Pictures Home Entertainment. They also are available now on digital and the all-new digital movie app Movies Anywhere. Building on the striking visual world created in “Pacific Rim,” the sequel features a next-generation battleground complete with upgraded Jaegers and new Kaiju that offers a captivating a state-of-the-art spectacle perfect for your next night in. In “Pacific Rim Uprising “directed by Steven S. DeKnight, John Boyega (“Star Wars: The Force Awakens”) stars as the rebellious Jake Pentecost, a once-promising Jaeger pilot whose legendary father gave his life to secure humanity’s victory against the monstrous Kaiju. Jake has since abandoned his training only to become caught up in a criminal underworld. But when an even more unstoppable threat is unleashed to tear through our cities and bring the world to its knees, he is given one last chance to live up to his father’s legacy. Jake is joined by gifted rival pilot Lambert (Scott Eastwood, “The Fate of the Furious”), 15-year-old Jaeger hacker Amara (newcomer Cailee Spaeny), returning veterans Charlie Day (“It’s Always Sunny in Philadelphia”), Rinko Kikuchi (“Pacific Rim”), Burn Gorman (“The Dark Knight Rises”) and a talented crew of fiercely young cadets. The international cast also includes Tian Jing (“Kong: Skull Island”) and Adria Arjona (“Emerald City”). Rising up to become the most powerful defense force to ever walk the earth, they set course for a spectacular all-new adventure on a towering scale. Extras on “Pacific Rim Uprising” include a director’s commentary; deleted scenes with director’s commentary; “Hall of Heroes,” in which star Boyega takes us through the awesome weaponry and cutting-edge enhancements of the latest generation of Jaegers featured in the film; “Bridge to Uprising,” in which the cast and crew discuss how the world of Pacific Rim has changed in the ten years since the events of the original film; “The Underworld of Uprising,” which delves into how humanity won the Kaiju War, but every war has casualties. Boyega and DeKnight give a tour of the coastal “Relief Zones;” “Becoming Cadets,” which allows the viewer to step into the Shatterdome, and learn the grueling physical and mental preparation required of the young actors who portrayed the PPDC cadets; “Unexpected Villain,” where the viewer learns the secret reason that turned one of the most beloved heroes of the original film into a villain obsessed with humanity’s destruction, and more. The acclaimed indie drama “Flower” arrives on DVD Tuesday June 19, from Lionsgate Entertainment. Zoey Deutch stars as Erica, a sassy suburban Los Angeles high school student, whose side gig is blackmailing older men she and her pals catch on video doing things to her that they shouldn’t be doing with a minor. Erica’s motivations aren’t purely selfish. She hopes to raise enough cash to bail her long-absent dad out of jail. In the meantime, she lives with her free-spirited mom (Kathryn Hahn), who’s new boyfriend has a teenage son just getting out of rehab and yet still has psychological issues. Surprisingly, pretty Erica and pudgy Luke (Joey Morgan) connect, especially when Luke tells her that one of the main reasons he has anti-social behavior is because he was molested by a teacher. Luke and Erica, along with a couple of her friends, concoct a scheme to catch the guy, whom they’ve seen before at a local bowling alley. It doesn’t take long for Erica to befriend Will (Adam Scott) and soon they are making out in his car. Erica, however, has mixed feelings about trapping him, because she kind of likes him. Still, she and her friends plot to get into Will’s house, drug him and take damaging photos that will end his career. When their plan goes horribly awry, Luke and Erica take off for Mexico, and soon Luke reveals that his earlier story was not completely accurate. The film is directed by Max Winkler, son of Henry Winkler (“Happy Days”) and his wife Stacey Furstman. The DVD includes an audio commentary with Winkler and Deutch. The brutally executed parody “The Death of Stalin” arrives on DVD and Digital Tuesday June 19 from Paramount Home Media Distribution. The film will also be available for sale or rental from cable, satellite and telco providers through IFC Films. Written and directed by Emmy award winner and Oscar nominee Armando Iannucci (“Veep, “In the Loop”), “The Death of Stalin” follows the tyrannical ruler’s hapless inner circle in the days after the brutal Soviet leader’s death. As they scramble to come up with the next evolution of the revolution, it’s clear everyone is really out for themselves. The comedy stars Steve Buscemi, Simon Russell Beale, Rupert Friend, Andrea Riseborough, Jason Isaacs and Michael Palin. “The Death of Stalin” DVD includes a behind-the-scenes featurette entitled “Dictators, Murderers and Comrades… Oh My!” as well as deleted scenes. Bring the boys together for the wildly hilarious and raunchy “Frat Pack,” arriving on DVD, Digital, and On Demand Tuesday June 19 from Lionsgate. When Moira (Beverly D’Angelo) decides to marry into a larger-than-life American family, her son, Elliot (Richard Alan Reid), is dragged on a road trip across the country with his soon-to-be stepbrothers for an epic alumni-weekend fraternity rager. On the road, the gang meets drug dealers, tattoo artists, snooty clerks, and party gals who don’t act like ladies. All the while, Elliot’s dying to make a pass at cute Skylar — but will he pass out instead? The out-of-control comedy also stars Danny Trejo, Lochlyn Munro, and Hana Mae Lee. The Frat Pack DVD will be available for the suggested retail price of $19.98. With three classic adaptations, “The Best of Agatha Christie, Volume 3,” and “The Best of Agatha Christie, Volume 4” make their DVD debut on June 19, from Acorn. With four classic adaptations, “The Best of Agatha Christie, Volume 4” includes Agatha Christie’s most well-known sleuths, Miss Marple and Hercule Poirot solving crimes with stellar ensemble casts, including Zoe Wanamaker (“Harry Potter” films), Lindsay Duncan (“Sherlock”), Joanna Lumley (“Absolutely Fabulous”), and Hugh Fraser (“Sharpe”). The two-disc DVD set features four programs ($39.99, Amazon.com). “The mysterious Affair at Styles,” features Poirot (Suchet) and Hastings (Fraser) tackling their first case together when a wealthy old woman is poisoned; “Dead Man’s Folly,” in which fiction turns to fact when a girl is killed at a murder hunt devised by crime writer Ariadne Oliver (Wanamaker), who calls upon Poirot to help; “The Mirror Crack’d from Side to Side,” in which Miss Marple Julia McKenzie, “”Cranford”) ponders a cast of suspicious characters when a villager dies at a party hosted by a movie star (Duncan). Joanna Lumley (“Absolutely Fabulous”) also stars; and “A Caribbean Mystery,” in which after the death of a fellow guest at a posh hotel, Miss Marple unravels a web of dark magic and deceit. “Miss Marple” episodes are also available on Acorn TV. Acorn TV is a popular North American streaming service focused on British and international television from RLJ Entertainment. World-renowned as the Queen of Crime, Agatha Christie is the bestselling novelist of all time, perennially winning new fans since the 1920s. In these television adaptations of her finest mysteries, star-studded casts and lavish period detail bring Christie’s work to life. 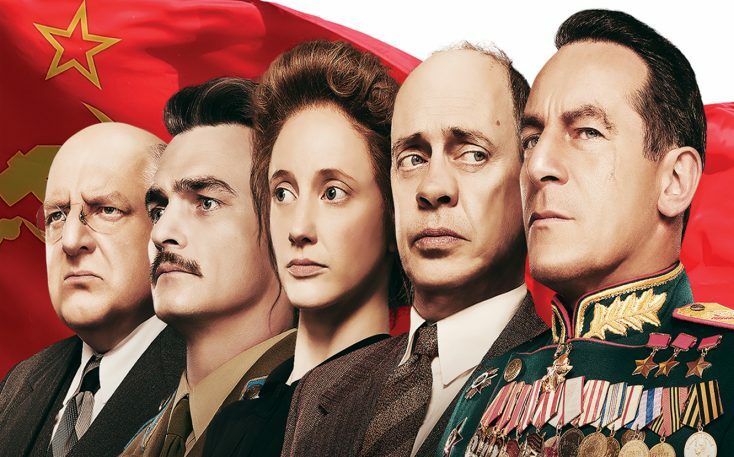 This week, Front Row Features is giving away a copy of the uproarious dark comedy “The Death of Stalin” on DVD to two lucky readers. To enter the contest, simply email socalmovieeditor@aol.com by June 25 for your chance to win. Good luck! Next PostPhotos: ‘Pacific Rim Uprising,’ ‘Death of Stalin,’ ‘Agatha Christie,’ More on Home Entertainment … Plus a Giveaway!! !